One of the fun challenges Heather gave us at our Demo Christmas Dinner last Friday was to make a Holiday Card using only the cardstock she had sent us. We could add any neutral card stock and other embellishments besides the red grosgrain ribbon that was sent and our choice of stamp. It was amazing how each card was so different yet using the same product. 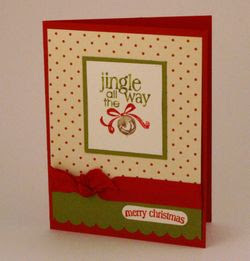 This is the card I made using "Christmas Classics". The stamped image and sentiment was heat embossed using clear embossing powder .